Credit card is a plastic card that fits easily in your wallet and allows you to make cash free purchases. 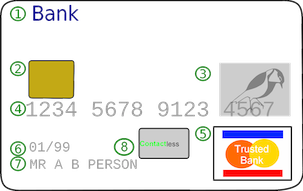 There is a unique number embossed on each credit card and a limit of credit assigned. The user can buy services and goods with their card and pay interest on the money spent each month instead of paying the complete amount used. The unpaid amount of every month is carried forward to the next month and the interest is calculated accordingly. Most cards have an interest rate of typically 10% to 30%; it is advisable to check the interest rate before getting a credit card. Most cards privilege their customers with rewards and offer points on purchase from specific retail or online stores. There is also a yearly fees associated with certain credit cards, while there are free credit cards also available. The credit card issuer companies earn through interest paid by the user, yearly fees and late fees. They also charge retailers on each sale via credit card. Anatomy of a credit card? 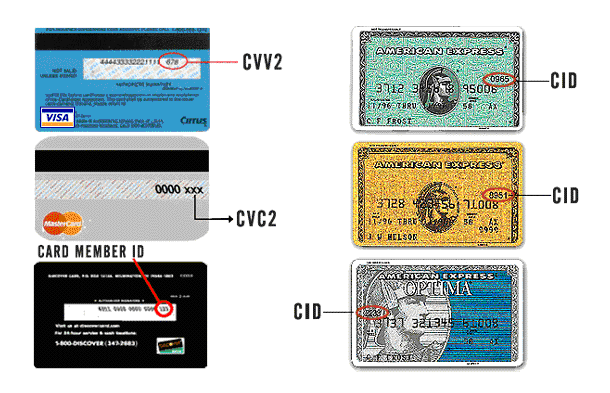 Credit cards use various types of security codes like CVC2, CVV2, CID, and CSC. MasterCard uses CVC2 and Visa uses CVV2, Discover and Amex uses CID (card identification number) and Debit Cards use CSC (card security code). Stolen Cards - As the name suggests, the card holder is robbed of the card physically or card is poached from the mail before it reaches the card holder. User can immediately get the card cancelled by intimating the issuer company. Duplicated Cards - Merchants put the credit card in a secondary machine for copying it. These machines are easily available as they are multi-purpose. Application Fraud - This is similar to identification theft where a person files in the information of another person into the form using stolen or fake documents. Account Takeover - the fraudulent person requests a change of address by using genuine card holders personal information and then at a later date reports that the credit card was stolen. The new card will be mailed to the new address and will be used by the thief. Skimming - Payment receipts or account number or the security code of the credit card is copied to be used at a later time. Carding - In this process the card is not used but its number is used to verify its validity.. Using devices like generators (hopefully not mine) the thief enters the card information on any site that uses real-time processing of transactions. If the purchase is successful it means the card is still good, and is sold off to other individuals who will perform the fraud. Typical price range for these cards is upwards of $50 dollars per card. Credit cards, debit cards along with gift cards and store cards all have a PAN (primary account number) and are created using the ISO/IEC 7812 standard. The number used is made up of four parts. Major Industry Identifier (MII) - this is the first digit of the PAN; Industries listed are Airlines, Travel, Banking, Petro, Helthcare, and Merchandising. Issuer Identifier Number (IINS) - the first six digits of a card number including the MII. The account number starts from the seventh digit to the second last digit, and can contain a maximum of 12 digits. The company issuing the card creates this number. 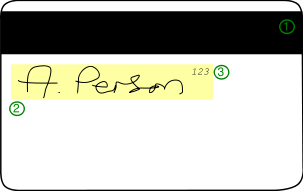 The final digit is a check digit which can be figured out using Luhn's algorithm. If you want to learn more about the validation of credit cards check out Credit Card Validation.